The Global Volcanism Program has no activity reports for Nila. The Global Volcanism Program has no Weekly Reports available for Nila. The Global Volcanism Program has no Bulletin Reports available for Nila. The 5 x 6 km Nila Island in the Banda Sea is comprised of a low-rimmed caldera breached at sea level on the south and east, with a 781-m-high youthful forested cone. Phreatic eruptions from the dominantly andesitic volcano, also known as Laworkawra, have occurred from summit vents and flank fissures in historical time. 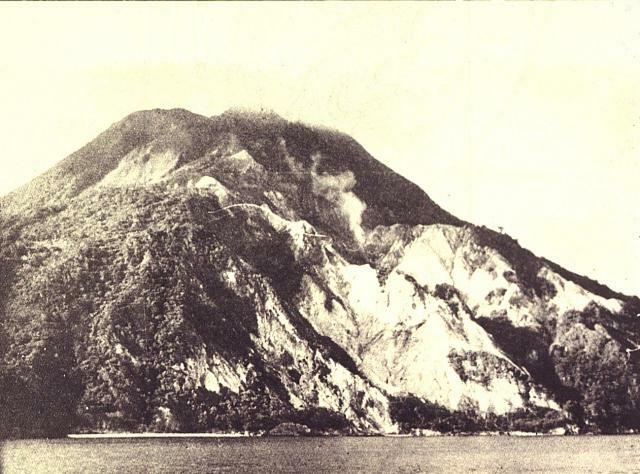 A 1932 eruption from a fissure that extended from the summit to the SE coast produced heavy ashfall that forced abandonment of Rumadai village. Jezek P A, Hutchison C S, 1978. Banda Arc of Eastern Indonesia: petrology and geochemistry of volcanic rocks. Bull Volcanol, 41: 586-608. Varekamp J C, Snellius II Shipboard Party, 1984. The Banda arc volcanoes, eastern Indonesia (abs). Eos, Trans Amer Geophys Union, 65: 1135. Vroon P Z, 1992. Subduction of continental material in the Banda Arc, eastern Indonesia: Sr-Nd-Pb isotope and trace element evidence from volcanics and sediments. Fac Aardwetenschappen Rijksuniversiteit Utrecht, 205 p.
There is no Deformation History data available for Nila. There is no Emissions History data available for Nila. Nila Island, viewed here from off its northern coast, is the emergent summit of a stratovolcano that rises 3700 m from the Banda Sea floor. A submarine vent is located off the north flank immediately west of the small island of Nika. Gas bubbles were observed along the rim of the submarine cone in 1932, when an eruption occurred from a fissure extending from the summit to the SE coast. 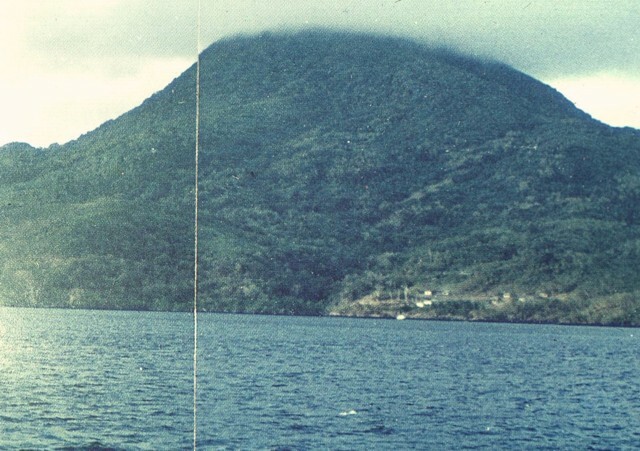 Photo by Rizal, 1976 (Volcanological Survey of Indonesia). A fumarole plume (right-center) rises above the steep SE slopes of Nila volcano, also known as Laworkawra or Lawarkawra. A remnant of the rim of a 5-km-wide caldera forms the forested slope at the left. The 781-m-high summit above it is a post-caldera cone that fills much of the caldera and extends to the sea at the right. Phreatic eruptions from Gunung Nila have occurred from summit vents and flank fissures during historical time. Photo by Ruska Hadian, 1975 (published in Kusumadinata 1979, "Data Dasar Gunungapi Indonesia"). There are no samples for Nila in the Smithsonian's NMNH Department of Mineral Sciences Rock and Ore collection. IRIS seismic stations/networks Incorporated Research Institutions for Seismology (IRIS) Data Services map showing the location of seismic stations from all available networks (permanent or temporary) within a radius of 0.18° (about 20 km at mid-latitudes) from the given location of Nila. Users can customize a variety of filters and options in the left panel. Note that if there are no stations are known the map will default to show the entire world with a "No data matched request" error notice. Large Eruptions of Nila Information about large Quaternary eruptions (VEI >= 4) is cataloged in the Large Magnitude Explosive Volcanic Eruptions (LaMEVE) database of the Volcano Global Risk Identification and Analysis Project (VOGRIPA).